Makeup Artist Joomla Template focuses on colourful, clean and elegant design targeting the beauty industry. The live theme magic customizer gives unlimited possibilities when choosing background and text colours. There are also over 5 different layouts for displaying articles. The responsive design makes it easily adaptable for all screen resolutions. The stylish and easy to use admin panel together with a wide range of customizable features enables the creation of an elegant looking site. 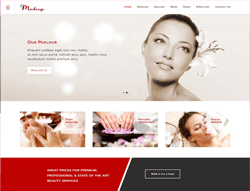 Makeup Artist is a fully responsive Joomla template built on T3 framework. This template requires no framework plugin to be installed in order for it to work.